The festival of Deepavali is undoubtedly the biggest and brightest festivals of Indian Culture. Irrespective of age and gender, people would love to celebrate the festival by having more sweets and letting go of all inhibitions and indulging to their heart's content. 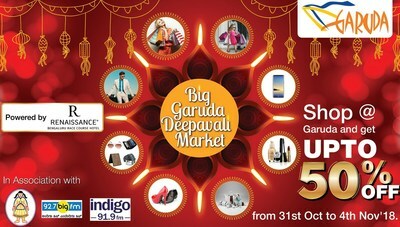 To be close to the cultural heritage this Deepavali, Garuda Mall will be hosting 'Big Garuda Deepavali Market', wherein over 50+ stalls will offer handmade diyas, rustic toys, organic products and organic food stalls and showcase some of the amazing handicraft works done by artists. Also, all the retail outlets at Garuda Mall will be offering a sale of up to 50% discount for the customers, from 31st Oct to 4th Nov, 2018. On display will be Clay Part Design, Terracotta and Jewels, Tribal Jewellery, Handicrafts, Jaipur Jewels, Chennapatna toys, Sanskruthi Dolls and many more along with live doll making workshops, demos and crafts that will be arranged for these 5 days. This event by Garuda Mall has been conceptualised to recognise our cultural heritage which would otherwise be lost with time. Come with family and let children be exposed to the rich culture and get a chance to savour exotic treats from this uniquely diverse sub-continent for the next five days. Celebrate this Deepavali at this event under one roof with Garuda Mall, which is still one of the most iconic landmarks of the city, that never backs down to provide the best experience to its customers. The Garuda Mall, one of the leading malls of India, is located at the heart of Bangalore's central business district and is spread across 75,000 sq. mts. of glittering shopping and entertainment space with five floors, and housing over 120 stores. The mall has lead the pack and pioneered shopertainment concepts with themed curated events, constant brand mix updates and more, making it the preferred destination for shoppers for over a decade.